France's most important national holiday, Bastille Day commemorates the beginning of the French Revolution with ceremonies, dancing, parties and balls all over the city. 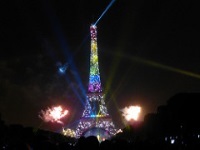 In the morning there is a grand military parade along the Champs Elysees - the oldest and largest regular military parade in Europe - accompanied overhead by jet formations, and after the day-long festivities, a fireworks display takes place near the Eiffel Tower. The day commemorates the storming of the Bastille prison on the 16 July 1789. Although the French Revolution was a bloody and tragic period of history the revolutionary ideals of freedom, equality and fraternity are proudly celebrated and for France this is a kind of independence day and a celebration of the development of a modern, democratic nation. It is a special day to be in France, particularly Paris, and visitors will be overwhelmed by the patriotism, ceremony and festive atmosphere.